ObjectCreate() allows creating user interfaces using graphical objects OBJ_BITMAP and OBJ_BITMAP_LABEL. Please note that in the comment the path to the file is written using backslash "\", and in the function "\\" is used. When specifying the path, always use only the double backslash as a separator, because a single backslash is a control symbol for the compiler when dealing with constant strings and character constants in the program source code. Example of an Expert Advisor, which creates a graphical label (OBJ_BITMAP_LABEL) using the ObjectCreate() function. The files are located in the folder terminal_data_directory\MQL4\Images. 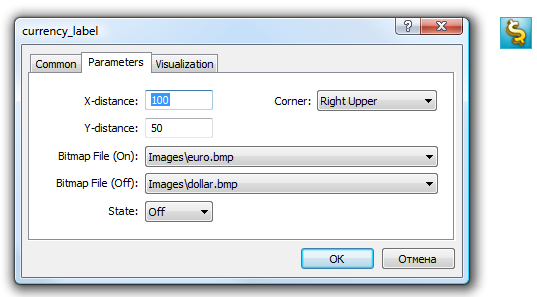 Object OBJ_BITMAP_LABEL is actually a button, which displays one of the two images, depending on the button state (pressed or unpressed): euro.bmp or dollar.bmp. The size of the button with a graphical interface is automatically adjusted to the size of the picture. The image is changed by a left mouse button click on the OBJ_BITMAP_LABEL object ("Disable selection" option must be checked in the properties). The OBJ_BITMAP object is created the same way - it is used for creating the background with a necessary image. The value of the OBJPROP_BMPFILE property, which is responsible for the appearance of the objects OBJ_BITMAP and OBJ_BITMAP_LABEL, can be changed dynamically. This allows creating various interactive user interfaces for mql4 programs. The #resource command tells the compiler that the resource at the specified path path_to_resource_file should be included into the executable EX5 file. Thus all the necessary images and sounds can be located directly in an EX4 file, so that there is no need to transfer separately the files used in it, if you want to run the program on a different terminal. Any EX4 file can contain resources, and any EX4 program can use resources from another EX4 program. The files in format BMP and WAV are automatically compressed before including them to an EX4 file. This denotes that in addition to the creation of complete programs in MQL4, using resources also allows to reduce the total size of necessary files when using graphics and sounds, as compared to the usual way of MQL4 program writing. The resource file size must not exceed 16 Mb. A resource is inserted using the command #resource "<path to the resource file>"
The length of the constant string <path_to_resource_file> must not exceed 63 characters. The file and folder names, included as resources, must be in English. if there is no backslash, it searches for the resource relative to the location of the source file, in which the resource is written. The resource path cannot contain the substrings "..\\" and ":\\". #resource ":picture_2.bmp" // must not contain ":"
#resource "..\\picture_3.bmp" // must not contain ".."
After a resource is declared using the #resource directive, it can be used in any part of a program. The name of the resource is its path without a backslash at the beginning of the line, which sets the path to the resource. To use your own resource in the code, the special sign "::" should be added before the resource name. #resource "\\Files\\Demo.wav"; // resource name - Files\Demo.wav"
#resource "\\Sounds\\thrill.wav"; // resource name - Sounds\thrill.wav"
It should be noted that when setting images from a resource to the OBJ_BITMAP and OBJ_BITMAP_LABEL objects, the value of the OBJPROP_BMPFILE property cannot be modified manually. 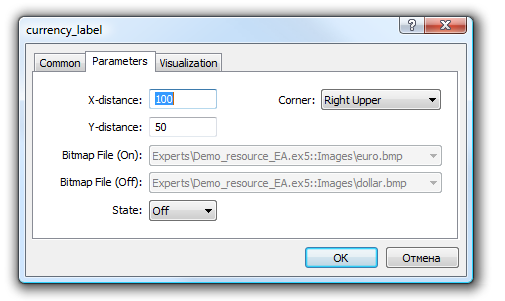 For example, for creating OBJ_BITMAP_LABEL we use resources euro.bmp and dollar.bmp. There is another advantage of using resources - in any MQL4 program, resources of another EX4 file can be used. Thus the resources from one EX4 file can be used in many other mql4 programs. Then its name, for using in the script itself, will look like "Files\triangle.bmp", and in order to use it, "::" should be added to the resource name. then the file will be searched for in the folder terminal_data_directory\MQL4\Experts\, if the Expert Advisor is located in terminal_data_directory\MQL4\Experts\. One or several custom indicators may be necessary for the operation of MQL4 applications. All of them can be included into the code of an executable MQL5 program. Inclusion of indicators as resources simplifies the distribution of applications. The case when a custom indicator in OnInit() function creates one or more copies of itself requires special consideration. Please keep in mind that the resource should be specified in the following way: <path_EX4_file_name>::<resource_name>. For example, if SampleIndicator.ex4 indicator is included to SampleEA.ex4 Expert Advisor as a resource, the path to itself specified when calling iCustom() in the custom indicator's initialization function looks the following way: "\\Experts\\SampleEA.ex4::Indicators\\SampleIndicator.ex4". When this path is set explicitly, SampleIndicator.ex4 custom indicator is rigidly connected to SampleEA.ex4 Expert Advisor losing ability to work independently.